An iPhone photo of our favorite campsite in Olympic National Park - right on the ocean! Pacific Northwest (7.5 weeks), including Olympic National Park, along the Oregon Coast and the California Redwoods (with a bonus stop at the Alvord Playa in Oregon). Eastern Sierra and Yosemite National Park (4.5 weeks). Some iPhone photos of our time on the road... From upper left: Cats enjoying the view of some birds, our first night spent at a Flying J Truck Stop, cats approving the farmer's market purchases in Anza-Borrego Desert State Park, having a bit of fun, walking a cat (which is more like a lot of resting with a few steps here and there), and a typical "office view" from the Airstream. We Feel Like We are Living Our Lives: A colleague recently posted this quote on Instagram, which is fitting here: “You’ll never remember the days you sat around watching TV.” While we still occasionally watch a TV show on one of our iPhones (currently The Americans and Homeland), being on the road helps make every day memorable. Being out in nature on a consistent basis is rejuvenating. It is so enjoyable to visit interesting, beautiful, and diverse places so regularly. We feel like we are making the most of our days, making memories at each place we visit, and doing the things we love most – being together, photographing, and spending time in beautiful places. Extended Stays: One of the best parts of this new lifestyle has been the ability to allow ourselves to savor a place. Because moving a trailer around takes time and is complicated, we have started staying most places for at least a week and often more. For our photography, this has added depth and diversity to our portfolios of the places we visit. 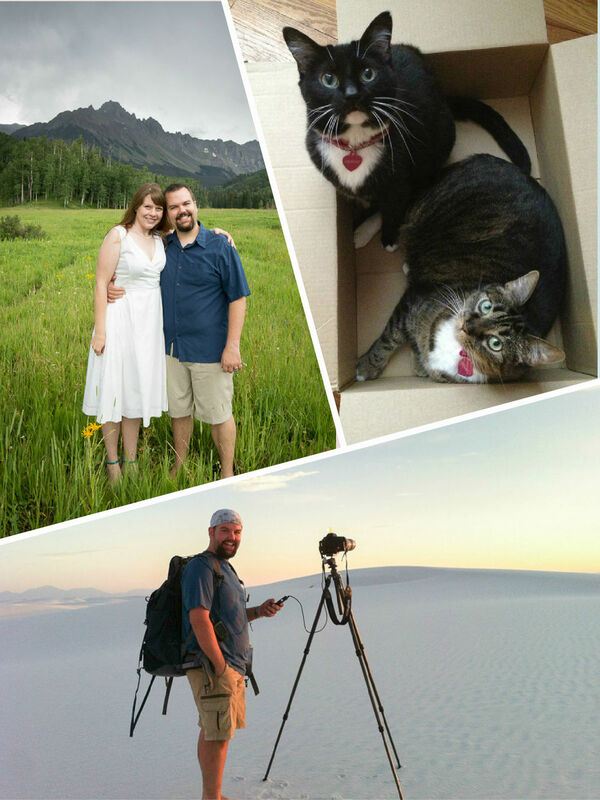 Seeing Friends: Most of our photographer friends are scattered all around the United States (and beyond), with people converging on some of the same places for photography at certain points in the year. This means that we have been able to see friends or meet new people in almost every place we visit, a major benefit of being semi-nomadic. The community of Airstreamers is also very welcoming and we have really enjoyed meeting other nomadic travelers along the way, each with their own inspiring story of why they are choosing to live an interesting life. Having Semi-Nomadic Cats: Aside from the drives, our cats enjoy living from the Airstream since there is so much to observe just beyond our windows. Having them along for the journey allows us to take extended trips since it would be irresponsible to regularly leave them with a petsitter for so long. And, it is pretty sweet to wake up in Yosemite National Park with two soft, sweet kitties sleeping next to us. From the upper left... The Airstream in Zion National Park, a peak inside the trailer, hiking in the rain, and a kitty exploring a campsite. Feeling Too Busy: We often have to remind people that we are not on a permanent vacation – we are working from the road. In my old career-oriented life, I regularly worked 60-70 hour weeks, so the “busyness” of our new situation is not even comparable. Still, the to-do list always feels too long, the backlog of photos is even bigger than it was, and there is a constant tension between needing to work and being in a place meant for play. I also had planned to write a blog post about every place we visit and I have failed miserably at that goal. Getting work done takes a lot more discipline than it does at home since photography and hiking opportunities are literally right outside our door on a consistent basis. The Quest for Internet Access and the Power/Solar Conundrum: Since wild camping and staying in public parks is a top priority for us, finding places with reliable internet (so we can work during the days) and sun for our solar panel can sometimes feel like a complicated equation. We have been able to work things out in every place we have visited except for Joshua Tree National Park (no internet), but some days we just want to go places without worrying about a cell phone signal. While our 200W solar panel is fantastic, we really need to invest in a rooftop system so we are not always rationing power. Planning Ahead: One major lesson learned is that we need to plan well in advance if we want to visit some popular spots, like Zion and Yosemite National Parks, and camp in the park (which we always want to do). While it is possible to make reservations at some places in the days before we plan to visit, it has required a shift in our mentality to make reservations months in advance in a few cases. We used to have a general sense of where we were going (“desert southwest” for example), only making a specific decision as we were in the car and driving. After camping in a place like Zion for weeks during peak fall colors, the planning all feels worthwhile even if it does reduce our flexibility. Compromises: This lifestyle comes with compromises. We would like to do more international travel and backpacking, but with so much invested in our current set-up, we are focusing our time on North America for now. Because I am away from home so much, I have had to pass on some career opportunities that I would have jumped at a few years ago. And, some of my colleagues think my consulting skills evaporated the moment I decided to travel more, even though my ability to complete projects hasn't changed all that much. On balance, it all feels completely worthwhile but accepting these sorts of compromises for the alternative opportunities we have now had to be a deliberate decision to make all this work. Finally, the thing people wonder about but rarely ask directly: how do you afford all this? The primary answer is that we live well below our means and we have made very deliberate decisions to direct our financial resources to the priorities in our lives: photography, travel, and spending time together in interesting places. Aside from a small house-payment, we have no debt. This is one of the primary puzzle pieces to making this kind of lifestyle work because financial freedom equals the flexibility to try this kind of crazy adventure. We saved up and published three photography ebooks to buy the Airstream, truck, and everything that came along with it. The only thing we splurge on is eating out and even though we travel a lot, we do it in an affordable way (free camping, public parks, etc). And, we are using camera gear we have owned for years, saving many thousands of dollars that we could instead use to help finance our travels. Based on this first year, we plan to continue living this way for the foreseeable future. We may consider doing a year or two fully on the road, but I am not quite ready to be away from home for such a long period of time for some family reasons. Based on our first year of experience, our last piece of advice for those thinking of doing something similar is to enthusiastically go for it if you can make it happen. Every day on the road feels like a day well-lived doing the things we most want to do. If you have any questions about our Airstream, our life on the road, or anything else related to this post, please share them below!